1791 ~ beginning of the 1800s: born in Kamigata. Disciple of Arashi Sangorô III, his first stage name was Arashi Tominosuke II, although he had no direct relationship to the great onnagata Arashi Tominosuke I. He served his apprenticeship in Kamigata koshibai or miyaji shibai. 5th lunar month of 1807: he took the name of Arashi Tomisaburô II, became wakaonnagata and played the role of Onaka in the drama "Natsu Matsuri Naniwa Kagami", which was staged at the Goryô no Shibai in Ôsaka. 11th lunar month of 1808: Tomisaburô made his debut in ôshibai, in Ôsaka at the Naka no Shibai. Fall 1811: Tomisaburô went to Edo. 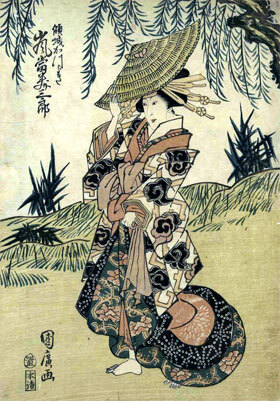 11th lunar month of 1811: Tomisaburô performed at the Nakamuraza in the kaomise drama "Azuma no Hana Iwai no Dairi". 1st lunar month of 1812: Tomisaburô's rank in the Edo hyôbanki, wakaonnagata section, was jô-jô-(shiro)hankichi (superior - superior - (white) half excellent). Summer 1812: Tomisaburô went back to Kamigata. 1st lunar month of 1818: Tomisaburô's rank in the Kamigata hyôbanki, wakaonnagata section, was jô-jô-(shiro)kichi (superior - superior - (white) excellent). He shared the same rank with Nakamura Matsue III. 9th lunar month of 1822: Tomisaburô played at the Minamigawa no Shibai the role of the courtesan Umegawa in the drama "Koi Bikyaku Yamato Ôrai"; his stage partners were Kataoka Nizaemon VII (Magoemon) and Ichikawa Danzô V (Kameya Chûbê). He also played the roles of Princess Minazuru and Okyô in "Kiichi Hôgen Sanryaku no Maki". 11th lunar month of 1822: Tomisaburô was back in Ôsaka and played at the Naka no Shibai the roles of Tonami, Yae and Tatsuta in the drama "Sugawara Denju Tenarai Kagami"; his stage partners were Kataoka Nizaemon VII, Arashi Koroku IV and Arashi Kitsusaburô II. 4th ~ 6th lunar months of 1826: tour in Tsu and Nagoya with Asao Gakujûrô, Ôtani Tomoemon II and Arashi Kitsusaburô II. 5th lunar month of 1829: tour in Miyajima with Ichikawa Danzô V; he played the roles of Tonase ("Chûshingura"), Yûgiri ("Kuruwa Bunshô"), Koharu ("Ten no Amijima"), Misao ("Ehon Taikôki"), Koman ("Genpei Nunobiki no Taki"), Yae/Tonami ("Sugawara Denju Tenarai Kagami"), Hisamatsu ("Imose no Kadomatsu"), Okon ("Ise Ondo") and Yaegiri ("Komochi Yamanba"). 16th day of the 8th lunar month of 1830: Tomisaburô died in Ôsaka. Arashi Tomisaburô II was active in Kamigata from the 1800s to 1830. He was able to perform a wide range of female roles. He was popular and his last ranking was only one black stroke below the prestigious jô-jô-kichi (superior - superior - excellent) rank [visual].